Psychiatry is one of the most unique clerkships you will have during third year. You spend a lot more time talking with patients and don’t spend much (if at all) time doing physical exams. Your learning is a bit more focused than in some of the other clerkships. Instead of diagnoses that range in many organ systems, psychiatry focuses more on psychiatric illness and related neurology. For many students, this is one of the less time-intensive clerkships, too. Therefore, you should have plenty of time to study and cover a few different resources for the shelf. Although some will say that this is an “easier” shelf, I wouldn’t sleep on it. We list the best psychiatry books for medical students below. 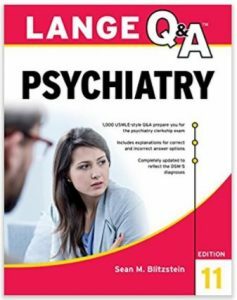 Use UWorld, First Aid for the Psychiatry Clerkship and another source of questions (we suggest Lange Q&A) to give yourself the best chance at doing well on this shelf. If necessary, use the other books below as well for more information and practice. Finally, be aware the shelf does contain some neurology and medicine questions. If you haven’t had your neurology rotation yet, I recommend reviewing some neurology. One last note: although it can be good to buy used books to save some money, make sure you’re buying the most current edition of the books below (our links are to the newest editions) because the DSM V is not included in previous versions! First Aid for the Psychiatry Clerkship is the best book you can read for the psychiatry shelf and for arming yourself on the wards (although psychiatry is usually a bit more laid back than some other clerkships). This book is well-organized and it goes into the perfect amount of detail for the psychiatry clerkship and shelf. It covers all the necessary diagnoses (updated for DSM V), drug overdose and withdrawal syndromes, and psychopharmacology. There are also a number of “Wards Tips” which can be helpful for doing well on your rotation. Most importantly, it’s relatively short at a little over 200 pages. This is easily one of the best psychiatry books for medical students. I would try to read it by the end of your first week of the clerkship and perhaps a second time before the shelf. It is also a great resource to reference while doing practice questions (UWorld plus one of the two question books below!). By the way, if you’re choosing between this and the CaseFiles book, I would go with First Aid. You do not need both, and First Aid is the better of the two. Unfortunately UWorld does not have enough psychiatry questions to fully prepare you for the shelf. And there are not comprehensive, free question banks like there are for OB/GYN or family medicine. Therefore, you need another source of questions. In my opinion Lange Q&A Pyschiatry is your best source. This book has 1,000 NBME-style questions, although the question stems are usually a bit shorter than what you will see on the shelf. It will be the best use of your time to do the questions covering diagnosis and psychopharmacology. This is pretty much captured in the first 3 chapters of the book: “Child and Adolescent Psychiatry,” “Adult Psychopathology,” and “Somatic Treatment and Psychopharmacology.” If you have time, also take the practice tests in the back. This is another must-buy psychiatry book for medical students. 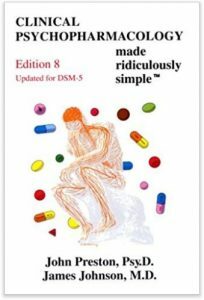 If you are weak in psychopharmacology, then we recommend buying Clinical Psychopharmacology Made Ridiculously Simple. This is an inexpensive book and a very quick read (only 83 pages). It will take you through high-yield psychiatric conditions (updated for DSM V) and which medications are indicated for the given disease. This is up to date with all the information you need. 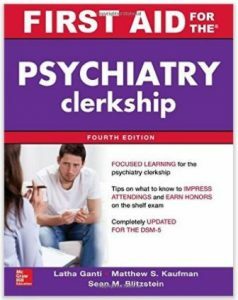 Although we don’t think this book will be necessary for everyone, it certainly is one of the best psychiatry books for medical students because of the value it adds to learning psychopharmacology effectively. We highly recommend this as a supplement if you want to improve your psychopharmacology knowledge base! The PreTest series is a staple for medical students. 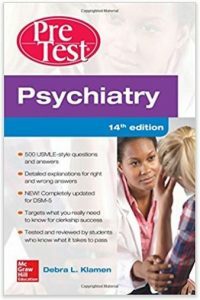 Psychiatry PreTest Self-Assessment and Review is another potential source of multiple choice questions to help you prepare for the psychiatry shelf. This book contains 500 more questions. It is well-organized into more subsections than Lange (e.g., there is a section of personality disorders) so you can home in on some of your weaknesses. However, this is not one of the stronger PreTest books. Unlike other subjects, I found PreTest Psychiatry to be lacking in some of the answer explanations. Answer explanations are extremely important when doing practice questions. Unfortunately, this book sometimes will not cover why certain answer choices are incorrect. It also covers some low-yield topics. Therefore, this is the lowest yield of our recommended psychiatry books for medical students. My suggestion would be to cover the questions in UWorld, Lange and the practice NBME tests before you touch PreTest.